OH HAPPY SPRING, HERE AT LAST. LET’S ALL LIGHTEN UP. After a weeks-long seafood jag, The Old Bride’s latest culinary focus has been on various cooking oils and vinegars. So this week, my darlings, we are tucking into a couple of tasty, but light, dishes that work splendidly either as a salad or as a side to accompany a meat, fowl or fish dish. I was looking for an excuse to combine the current crop of asparagus in a salad with some of the fabulous cranberry and pear infused white balsamic vinegar I had purchased at The Mighty Olive in Memphis. My experiment resulted in a dish that works well served either HOT OR COLD. I’m thinking some grilled chicken tenders or grilled jumbo shrimp would be tasty served with this salad. Combine rice and water in a medium saucepan with salt. Bring to a boil on medium and simmer to reduce liquid, gently folding the rice twice before covering and turning off heat. Leave on the burner fro 10 minutes, then remove from stove and ladle into a large mixing bowl, gently tossing to break apart the rice and accelerate cooling. Prep the asparagus by snapping off woody stem bases, and gently scraping woody stalks as needed (smaller asparagus require less scraping). Rinse and cut asparagus into 1-inch pieces. Place in steamer basket, and steam until tender. Combine the garlic, onions, pepper, balsamic vinegar and olive oil. Whisk until emulsified. Pour over the cooling rice and toss to coat completely. Sauté the almonds in skillet in 2 T olive oil until golden. Add the asparagus to the almonds and stir in sea salt. Pour into the rice mixture and toss to mix completely. Adds lemon juice and toss again. Fold in the craisins and orange segments. Serve hot, or chill in fridge and serve as a salad. Yields about 10 servings. This marinated salad is an old Southern favorite that my hubby’s North Carolina family served frequently. NOTE that I use extra light olive oil in my version. The Holly Springs Garden Club is serving my version April 11 and 12 at their Plant it Pink fundraising luncheons during the Spring Pilgrimage. 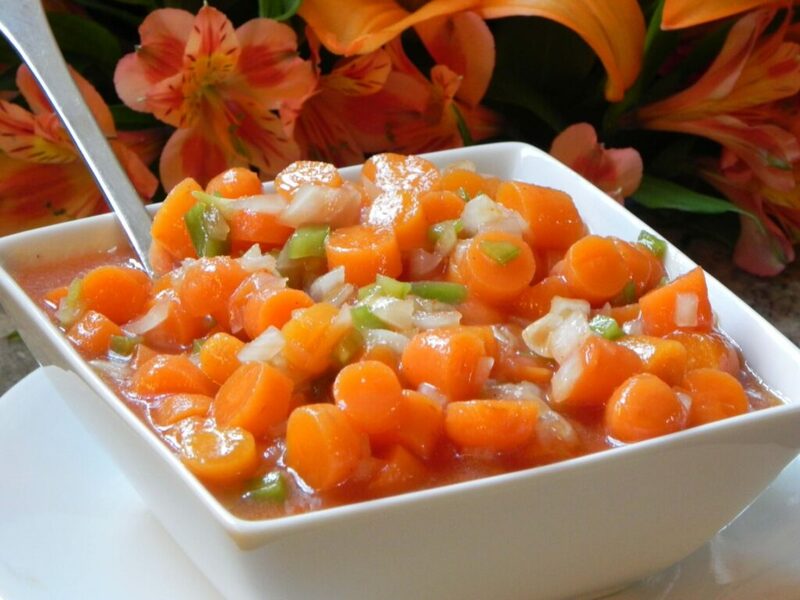 Cook sliced carrots in salted water until tender but still firm. Plunge into ice water to cool. In another pan, heat tomato soup with vinegar, oil, sugar and spices. Drain the carrots. Gently toss with the onions and bell pepper. Pour heated tomato soup mixture over the vegetables. Refrigerate for at least 24 hours. Lasts about 2 weeks refrigerated. VARIATION: Add small cooked shrimp and several slices of red onion before serving.